The first time I went to Gigi it was two days after their grand opening and Chef McGinnis was at the helm. The food was bad and the service would have been better had it been self-serve. The experience left such an impact that I didn't return until a month ago to hesitantly check out their brunch. In the over a yearlong hiatus from the restaurant, McGinnis had made his exit and a new chef had taken over the reins. My experience was so positive that my mind had been completely changed about Gigi’s. Luckily, the food had improved greatly; at least I can attest that the brunch offerings were good. I started with their french toast. Although, their version of French toast doesn’t really involve what us westerners consider usual toast. 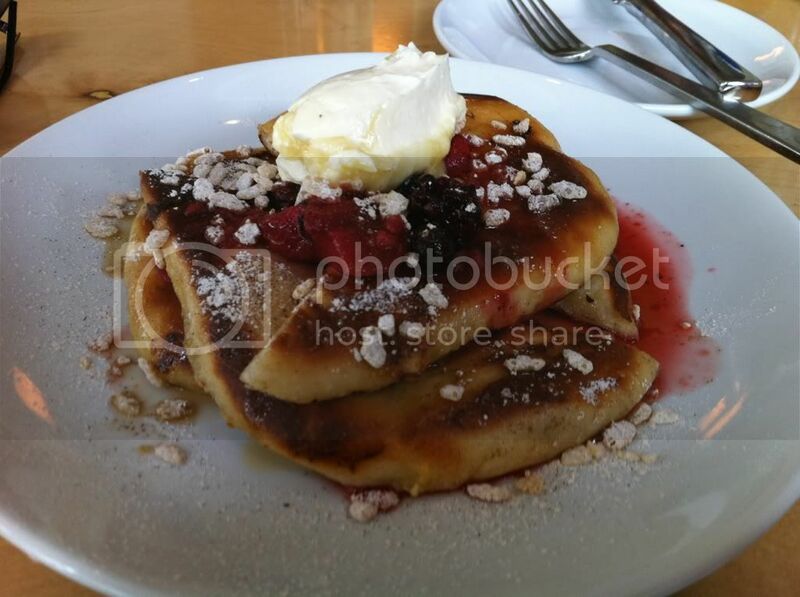 No slices of brioche or challah bread here kids, this appeared like a fluffy, airy and oversized pancakes topped with a delicious mixed berry compote, rice krispies and a giant slab of delicious honey butter. The mixed berries tasted wonderfully with blackberries, raspberries, strawberries and even blueberries tossed in. The rice krispies were sheer genius; they made the dish fun, jovial and gave it a fun little crunch. Slather on some of the honey butter and you can’t help but make an “O” face while eating this concoction. This was definitely one of the standout dishes in my book. .
Up next, I moved onto something a little bit more savory and had their poached egg with grits and bacon. 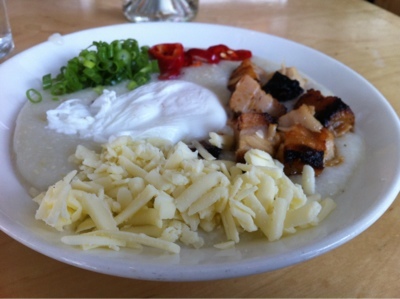 This dish comes nicely organized; a bowl of grits with a handful of scallions, red peppers, shredded white cheddar cheese and pork belly with a poached egg in the middle. The grits were really well cooked, creamy and although the presentation is nice, this dish was meant for destruction. So take out your frustrations and mix all that pork belly, cheesy, eggie goodness together. The peppers and scallions give this dish a nice dimension of heat and spice that you wouldn’t typically see in grits and it’s counter-acted by the creaminess of the egg yolk, cheese, and grits themselves. The pork belly is just great, nicely cooked and salted just right. Definitely comfort food with a great twist. 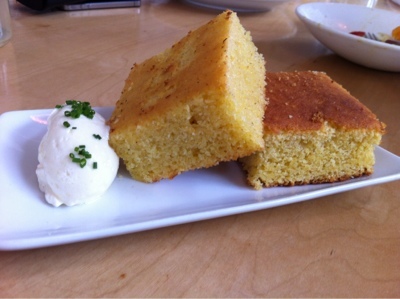 We also tried their cornbread with honey bacon butter. 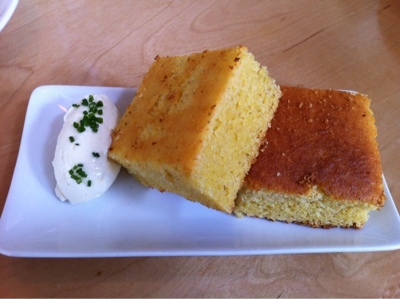 The cornbread itself was a bit dry, but the bacon butter really made this bread pop. The butter had the bacon's smokey flavor with a tiny sweetness of the honey. Lathering on a generous helping of the butter really made any of the bread's dryness feel irrelevant. Had the bread been fresh and warm from the oven, this would have been a total winner. The butter alone is just great, I was left wanting to lather it on everything, toast, eggs, the bumper of my car, you name it and I thought about it. My date went ahead and tried their avocado tomato salad. The tomatoes were different colored variations and seemed beautifully ripe. The avocado was also fresh and ripe. 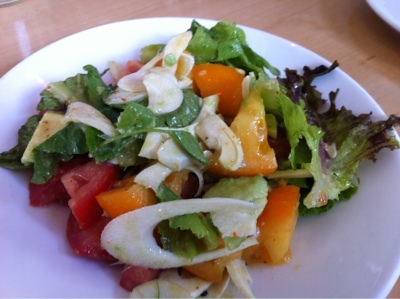 The salad also comes with slices of hearts of palm and it's all tossed in refreshing homemade citrus vinaigrette. I didn't try the salad because I was too busy stuffing my face with bacon butter and french toast, my date did say it was a very refreshing salad. I will attest that it looked insanely fresh and colorful. 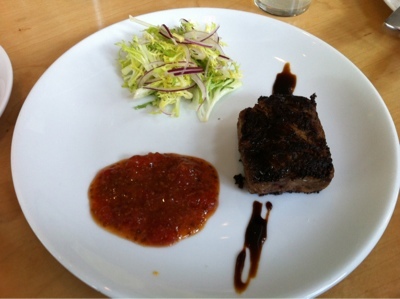 While my date south beached it with his salad, I decided to throw down on their braised short rib meat loaf. The way I saw it, this was almost like an Asian fusion take on vaca frita. The outside of the meatloaf is slightly charred and making the meat a little on the crisp side, I personally liked this. The inside of the meatloaf is shredded and juicy short rib. The meat itself has a nice drizzle of soy molasses over the top that give it a nice hint of sweetness, I personally really liked the meatloaf by itself. 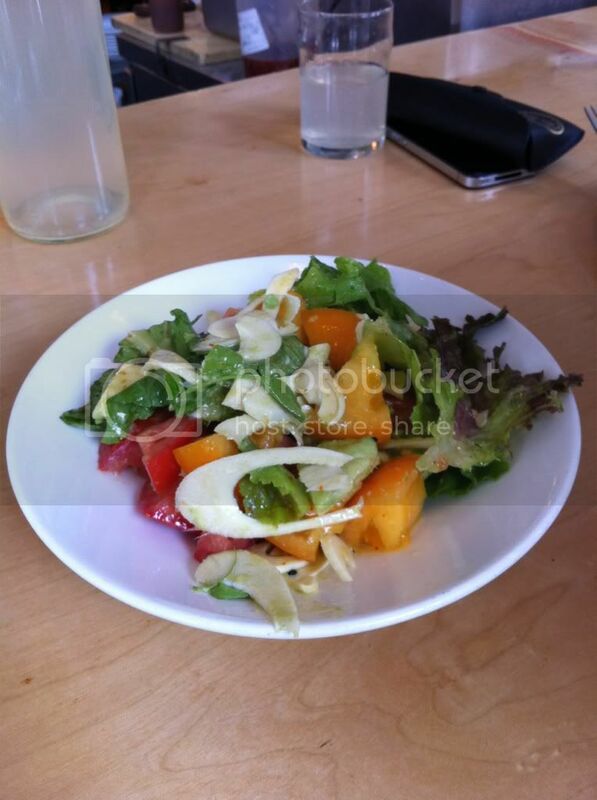 I felt the tiny side salad that was served alongside of it was superfluous and completely irrelevant. 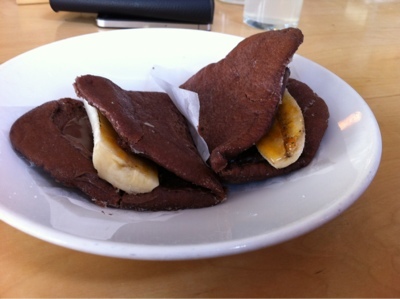 Lastly, for dessert we had their chocolate banana buns. A sweet take to their savory staple. These buns are made with chocolate, slathered with nutella, and then filled with caramelized fresh banana slices. Holy smokes, these buns will have you rolling your eyes to the back of your head and make you twitch your right foot, like a happy dog getting his belly scratched. They're ridiculously good and so simple. You'll have to catch yourself from inhaling them in two bites. I have to admit that after such a bad initial experience at Gigi over a year ago, this place has really turned itself around. This time around the food was great and hit the spot, whether for brunch or a 3 am fix on a Friday night. If you are in need of some good Asian fare in Midtown definitely, check this place out. The best part is that prices range from $4.00 to over $20.00 at any given time, so there is something there for every pocket. If you are one of those paranoid types, you can always sit at the bar and watch the chefs make your food in the completely exposed kitchen. However, if you sit at the bar you will see more than your cooks preparing your meal. It's been my experience that Gigi has a fly problem. With flies flying around the open airy kitchen from time to time. One gripe I will share about this restaurant is that Gigi’s charges for water and no, I'm not talking about bottled water. They charge a $1.00 fee for tap water; I think that is ABSOLUTELY ridiculous. The restaurant states the surcharge is because they filter their own water, but one could always counter that other restaurants, such as Harry's Pizzeria, filter their own water and DO NOT charge. I digress. Other than that, it’s definitely a place to try if you’re in the area and craving asian. Now I want French toast! 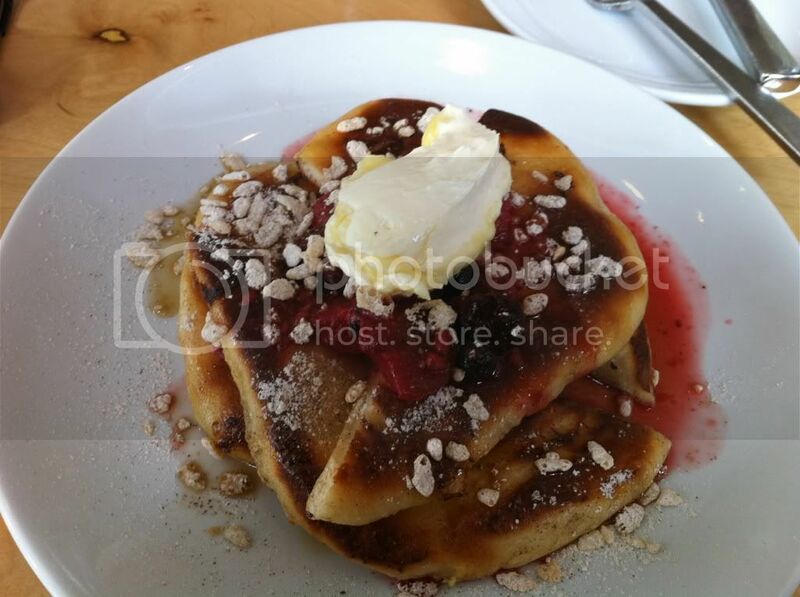 Your photos are mouth-watering. For brunch, I always turn to our favorite NYC catering service, but we'll visit Gigi when we visit Florida.